The Catedral de la Santa Creu i Santa Eulàlia in Barcelona is one of the city's most iconic monuments and has as many unusual features as it has stones. Its walls conceal stories of ancient Barcelona and its facade is one of the most photographed. The cloister, with the white geese of Santa Eulàlia, the five access doors, the ou com balla (dancing egg) and the 200 gargoyles that keep watch from the roof are some of the things to be discovered. The Gothic cathedral is more than a place of worship, it is a legend and one of the city's main attractions. Barcelona Cathedral has been contemplating the city throughout eight centuries of history. In the 13th century King Jaume II, the Just, decided to construct a temple over the remains of an earlier Romanesque church. The work, funded by the fraternities and guilds, took more than 150 years, but never interrupted the religious services. These days, the Catedral de Barcelona is one of the best examples of Gothic art in the city. Every day thousands of visitors take photos of the impressive 70 m high, Neo-Gothic façade. But the cathedral steps take you into a whole new world to be discovered. More than 215 rib vault keystones in the interior give you and idea of the cathedral's grandeur. Inside you also find the crypt of Santa Eulàlia, 29 dedicated chapels and a high altar above which there is an impressive Gothic stained glass window. For the most keen-eyed, the best test is to find the hockey game carved into the choir stalls. But the cathedral also hides secrets you cannot appreciate at first glance. On the roofs and pinnacles there are 200 gargoyles keeping watch from on high, but it is surprising to find a bull, a unicorn and an elephant among the monsters and demonic beings. Before leaving the lofty reaches, the temple's bells deserve a special mention. Of the 21 bells in the cathedral, all with women's names, the most remarkable is the rebellious Honorata. In 1714, during the War of Succession, Philip V "imprisoned" and melted down this bell in retaliation for it ringing to call the citizens to revolt. The cathedral's surprises go beyond its architecture. The garden, where you find the cloister, is guarded by the thirteen white geese of Santa Eulàlia, one for each of the agonies she suffered, as well as for the years of her life. 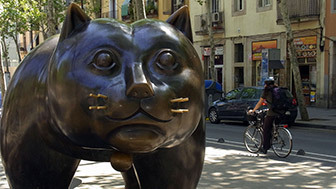 There is also a fountain, where an egg dances on the flowing water at Corpus Christi, a typical Barcelona tradition. 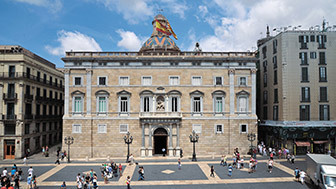 The passage of time has only increased the majesty of the cathedral, guardian and guide to the city, and from its terraces it blesses the entire municipality of Barcelona at 9 am on 3 May each year for the feast of Santa Creu. The heart of the ancient city of Bàrcino and the current administrative centre of Barcelona. 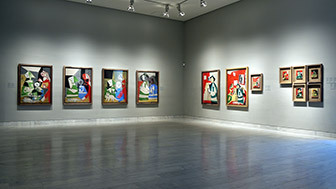 The Picasso Museum houses the most complete collection of works by the painter from his youth. Is now the neighbourhood with the city's wealthiest and most varied cultural offerings.